What username/password should I provide to log in? You should use same credentials as you normally use to access your WordPress Dashboard. Make sure the user account has sufficient permissions to manage galleries and albums, and upload images. Check permissions in WordPress Dashboard | Gallery | Other Options | Roles & Capabilities. Make sure the Server URL and XMLRPC Path are correct. Server URL is the full web address (including the http:// or https:// prefix) of your WordPress blog, e.g. http://myblog.com. XMLRPC path is the relative path of the XMLRPC service in your WordPress system, normally this should be set as /xmlrpc.php. You can test this your parameters by copying and pasting the Server URL value into your web browser's address bar - the browser should open your WordPress blog's home page. This means you have specified the parameters correctly, and the XMLRPC service is enabled. At this point you should be able to login with the credentials you normally use to log to WordPress administration panel. If something is still not working, submit your debug log and we'll do some heavy troubleshooting. If you get an errors message or a blank page, the XMLRPC service is either disabled, or something your hosting environment is interfering with the XMLRPC handler. I also found that in some cases GET request are working fine, but POST requests could be blocked. There is an online tool at www.hurl.it, which you can use to send an empty POST request to your site. Normally this should produce an XML response containing the "parse.error not well formed" message in the body. What could be blocking the XMLRPC interface? 1. The xmlrpc.php script is disabled. This is usually the case with shared hosting environments. Many hosting providers consider the XMLRPC protocol a security threat and they disable it on the web server, simply not allowing any script named xmlrpc.php to run. One solution is to rename the xmlrpc.php script in your WordPress installation, however this may get a little tricky. For information, see the following topic. 2. The xmlrpc.php script is blocked. A frequent cause of upload and connection related errors is the mod_security module. mod_security is an Apache module that provides intrusion detection and prevention for web applications. It aims at shielding web applications from known and unknown attacks, such as SQL injection attacks, cross-site scripting, path traversal attacks, etc. This all sounds good, however, when poorly configured mod_security can also shred totally innocent and legitimate requests. When this happens you can experience all sorts of trouble ranging from server errors ("HTTP Error 400 Bad Request" and "HTTP Error 500 Internal Server Failure") to seemingly random alterations and disappearance of API requests. If you have your own server and can configure it at your will I recommend disabling mod_security, at least to check if things start working as expected once your take mod_security out of the equation. Then you can work on configuring it correctly so it does not interfere with the WordPress API. Things starting to look more bleak if you are on a "shared hosting" plan where your provider controls Apache and PHP configurations. Some providers would work with you and make reasonable configuration changes, some (particularly those who provide free or nearly free hosting) would not change a thing. My only advise to you in this case is that you look for alternatives. 3. Other WordPress plugins interfere with XMLRPC. Various plugins trying to improve the security in WordPress make the XMLRPC interface inoperable. Among the usual suspects are the following plugins: Better WP Security and Role Scoper. To find the offending plugin I recommend disabling all security related plugins in your WordPress Dashboard and see if that solves the issue. If it does, start re-enabling those plugins one by one, each time testing your XMLRPC. If your test fails, then you know which plugin you have just enabled - that is the offender. There are also badly written plugins that simply add some HTML content to every server response with no regard of the expected response format. One of such plugins is the WP Retina plugin. I have also dealt with a good share of clients whose WordPress blogs were polluted by malicious "Black Hat SEO" techniques. For detailed info, see Black Hat SEO Technique Demystified – hideMeya. What is the "Precondition Failed" error? This is a frequent situation with shared hosting environments. Usually this is an indication that your hosting provider, while trying to harness security of your website, is also blocking the xmlrpc.php script using the mod_security module. The xmlrpc.php script is the communication link between your WordPress blog and remote applications. With the script blocked, my plugin will be unable to read information about your galleries or upload photos to your blog. With older versions of mod_security it was possible to override security rules by specifying custom rules in the local .htaccess files. With the latest version of mod_security you must have access to Apache configuration files in order to modify or override any of security rules. The only solution here is to rename the script. For details, see the following topic. My hosting provider is blocking the xmlrpc.php script. Can I rename it? All you need to do is rename xmlrpc.php your liking and edit the rename-xml-rpc.php script in the "Rename XMLRPC" plugin and set the $renamed_xml_rpc_filename variable to the new file name. Finally, on the Lightroom side, change the XMLRPC Path option in your Export and Publish settings to point to the new filename, e.g. "/topsecret.php". This should allow my plug-in to communicate with your WordPress. Why am I getting this message: "Server error. 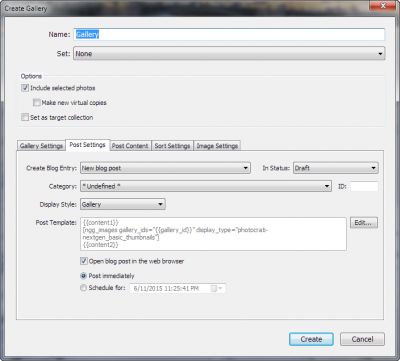 requested method ngg.getGalleries does not exist"
You don't have the NextGEN Gallery plug-in installed in your WordPress, or the plug-in is disabled. 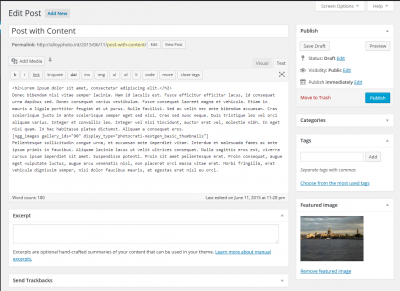 From your WordPress Dashbord, click Plugins and see if "NextGEN Gallery" is listed and enabled. If it's not in the list, click "Add New" and search for NextGEN Gallery. The NextGEN Gallery plugin by Alex Rabe should be first in search results. Click "Install Now" to install. Why am I getting "Could not create the gallery. 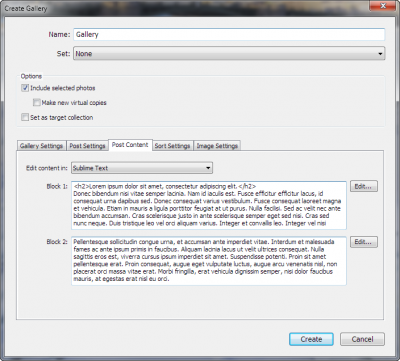 XMLRPC Fault Code: 500" error when creating galleries? HTTP Error 500 means a failure to execute PHP script on the server. Most likely, this is permission related. For example, this happens when the parent folder is not writable, or when your server is running in Safe Mode. 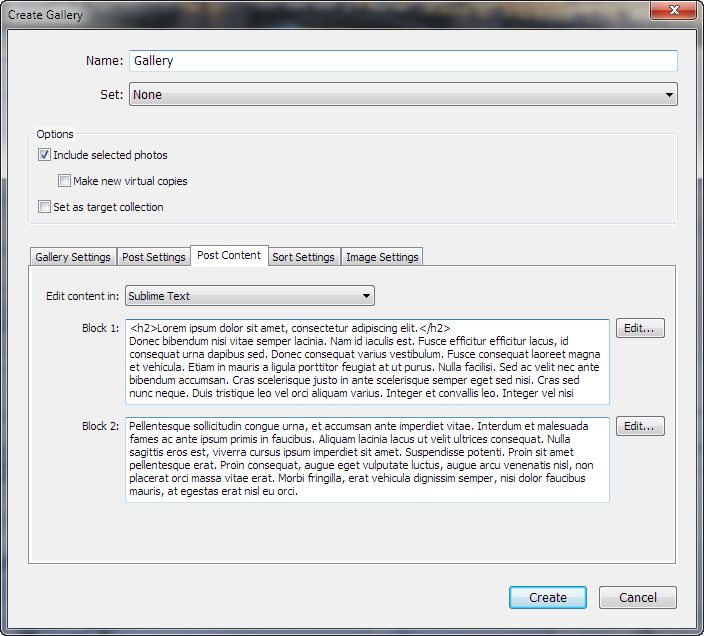 Check if you can create galleries using the WordPress Admin interface. Your photo files are too large are being rejected by the server because they exceed the POST size limit. The default configuration of most PHP environments is very conservative about the allowed file size. You need to edit your php.ini file and set the following values. Note: you must restart Apache in order to use the new settings. There is an easy way to check and increase WordPress memory, see this article: How To Check and Increase PHP Memory Limit In WordPress. This great tip is a courtesy of Rich Turner. HTTP Error 500 means a failure to execute a PHP script on the server. A detailed error description can be found in Apache's log file. I am able to upload photos, however thumbnails are not generating. How to fix that? This means the NextGEN Gallery Plugin on the server is unable to render thumbnails for uploaded images. This happens when the uploaded images are small enough for the "post size" limit, however the memory limit is insufficient to let the graphical library process images. To solve this, you need to edit your php.ini file and increase the memory limit. Note: you must restart Apache in order to use the new settings. I am getting a weird error "You are not authorized to delete posts in this category." What does this mean? You have the Create Blog Entry option set as "New blog post" or "New page". You can solve this by setting correct permissions in your WordPress. This combination produces good quality JPEGs for viewing purpose, typically 600 - 900KB in size. Keyword tags and other metadata are not showing for uploaded photos. What could be the issue? Make sure to turn off resizing on the server (in WordPress Dashboard, go Gallery > Other Options and set the Automatically resize images after upload option to No. If you also need other EXIF and IPTC metadata, select the All Metadata option in Lightroom when uploading photos. I get a "catalog update failed" when trying to install an update. How to fix this? This error is sometimes generated by Lightroom when you install a new version of the plugin and the plugin attempts to update its custom metadata fields in the catalog. Sometimes this can be solved by disabling and then re-enabling the plugin you are trying to update (use the Status panel in the Lightroom Plug-in Manager to do so). If that does not work, disable all available plugins, then re-enable them one by one. This option was added in version 1.2.8. This enables you to implement additional security measures at your server, as outlined in RFC2617. Two HTTP Access Authentication methods are supported - Basic and Digest Access Authentication. Note: this is an additional authentication method, which you can use to restrict access to the xmlrpc.php script - the WordPress API endpoint. The user name and password for this authentication method should be different from your WordPress user name and password. I am getting the following error message "Error processing server response: The following tags were not closed: methodResponse..."
This is caused by using the UTF-8 encoding of some PHP script within WordPress, usually in a plugin script. UTF-8 encoding creates a 3-byte sequence of special control characters (the byte order mark) at the beginning of the file, which PHP simply passes through to the output. These control characters appear at the beginning of any response including XMLRPC responses, making them longer than is specified in the response header. In result, these responses become truncated. It might be a long process, but you need to find the script (or multiple scripts) that use the UTF-8 encoding and change it to "UTF-8 NO BOM", or to ASCII if the script does not use any non-ASCII text. I am getting an XML parser error "Extra content at the end of the document". What does this mean? This error is usually an indication of an incorrect content type in the server response. For example, instead of XML it returns an HTML page. Most likely, you are either using the wrong XMLRCP path or the XMLRPC handler on the server malfunctions. Looks for tips on troubleshooting the XMLRPC handler at the top of this page. How do I use a blog post template and put a text content there? 1. Modify the post template and insert placeholders from content blocks. You can use two blocks if you want to display the gallery between two blocks of texts. Better yet, modify the global templates in NextGEN Gallery Post Templates section (you'll find it in publish/export options), so you won't need to adjust the layout every time you post. 2. When you create a gallery, enter your contents blocks on the Post Content tab. For convenience, use an external editor. Mac OS comes with TextEdit - a good HTML capable editor. Windows users are not so lucky, but there are many 3rd party options. 3. Proceed with creating the gallery and uploading photos. Now you have your post complete with text content you have just entered. Many hosting providers are protecting sites from vulnerabilities related to the xmlrpc.php script. These vulnerabilities include remote code injection, ping-back exploit, and brute-force attacks using the XMLRPC wp.getUsersBlogs method - some already resolved in recent versions of WordPress. However, the xmlrpc.php script is still considered unsafe, and many hosting providers either rate-limit requests to that script, or block it completely. Depending on how the security measure is implemented at your server, you may experience one of the above mentioned "weird" behaviors and errors. Speak with you service provider and find out whether they actually have security measures for the xmlrpc.php script in place. If they rate-limit requests, you can experiment with the throttling option (NextGEN Gallery Export Options > Server Performance Tuning) and impose artificial delays between consecutive requests. If they completely block the xmlrpc.php script, you can try the renaming technique explained earlier. Better yet, rename and implement Basic HTTP Authentication to prevent unauthorized access to the script and specify authentication credentials using the "Advanced" option in the My Server section of the plugin. Also keep in mind that hosting providers usually will rate-limit access to servers on a shared hosting plan. Because multiple sites share resources of a single server, the provider is required to balance access and resource usage among all sites. In this case frequent requests fall into the fair use category, rather than being a security concern. A number of issues have been identified with NextGEN Gallery 2.0.0 and you appear to be affected by those. As far as I understand, the Photocrati team is working to resolve them as soon as possible. A really wonderful plug in you have made. Thank you! I was wondering if we can select the featured image for the post via the plug in. This does not work with posts because you need to explicitly specify the image ID, and the ID does not exist before the upload. You can select the featured image only for a gallery using the “Assign Preview Image” function (in Publish Service’s extras). I also would like something similar, where the blog posts that are created have the featured images automatically selected. Is there a way for this to happen? A way to associated the created blog post with the image it should display? Hi, thanks for your work! It has helped made photo posting alot easier. While there are defintiely several features I hope to have, not everyone may need them. However, I would very much like to have to ability to set featured image on the post via the plug in. Will make life a whole lot easier! Failed to move image from [upload path] to /serverwww/wp/gallerysub/… and thats my problem. So the slug "/wp-content/gallery/" is bissing inbetween the destination path. Can someone help where to fix it? That is one of the issues I reported to Photocrati a while ago, but still remains unfixed in 2.0.11. The error happens when you attempt to replace an existing photo. Anybody knowing what to do? In order to manage 4 blogs you would need to create 4 publish services for NextGEN Gallery, each with their unique settings. I just bought your plugin and I have a problem for pairing my old Nextgen galleries. My pictures are renamed as date + name (ex 04102013-img_6607.jpg) and the tool dosn't find matches with any settings (capture time doesn't work anyway). Would it be possible to add a customised option? Benjamin, try running Associate Images using the File Number Suffix option – that is exactly the scenario it was designed for. I cant figure out how to set the colorspace for the exported jpegs. Is it automagically set to sRGB? Yes, it is set to sRGB. Hi, Vlad… I am interested in using your software to upload images from Lightroom 5 to a WordPress BLOG… What is the right software to do that? I thought this was it, but I'm confused. The description says it will export from LR to WP, but then there is a warning box that says it won't… which is right? As explained in the Requirements section on the plugin’s home page, you need the NextGEN Gallery plugin by Photocrati installed in your WP. Also, the blog cannot be hosted at wordpress.com because they don’t allow any plugins to be added, and the NextGEN Gallery isn’t included. Basically, you need to host WordPress on your own server, so that you have full control over it. I really like this plug-in it certainly makes uploading pictures way easier. Recently I upgraded to LR 5 and the 2.4 verion of the plug-in as well as my sight is now running 3.9 or Word Press and 2.0.66 of Next Gen plug-in (I also have the pro version of Next Gen). I have not uploaded images in a few months so all that happened between when it worked and now it does not work very well. I am getting 503 errors and my IP address has been blocked. My provider cleared that for me (and white listed it) but I am still getting 503 errors. I tried various throttel settings including 10s and nothing made much difference. Some times I get one or two images up but offten none are added. Creating new collections does not seem to be an issue but uploading images certainly is. What is the right solution here? Do I need to ask DreamHost to make different chagnes on the server side? Is there something I can do myself editing PHP settings or HTACCESS? Please see the last article on the FAQ page. I did. I tried the threshold settings to no avail. Are you saying the only thing that can be done is get my host to change their settings for the limits on how may requests can be made in a second? Does that mean that my provider made a change to that threshold recently or is there a software change in your plug-in that increased the frequency of requets. I will contact them. If you set the throttling interval to let’s say 1 second and that turns out to be insufficied (i.e. your IP is blocked again) you must wait until your IP has been unblocked before trying a larger interval. There wasn’t any change in the plugin that could increase the frequency of requests. #23 | Written by Ian Leslie about 5 years ago. OK sounds good thanks for the info. I will negotiate with them and hopefully then can tweak things if need be. I guess first I should find out how long I get blocked for so I know how to do a meaningful experiment. Thanks for your help. #24 | Written by Vlad about 5 years ago. Hint: the easiest way to check if you are still blocked is by attempting to access your site through the web browser. I got a message that there was an update. I clicked the button to install the update. Now the plugin won't run at all. I get a message, "Could not load post processing filter…"
Try restarting Lightroom. Contact me directly if that does’t solve the issue. You have a great upload tool, but I am having two issues. I am using NGG 2.0.66.27 and your lightroom plugin 2.5.3 Build 2010. 1) I check the box to replace previously uploaded photos but nevertheless it renames to -1 and leaves the old one there. My theme continues to use the old one. And 2) when I upload it takes a very long time to update the sort order (I have several hundred images in the gallery). Can you just leave the sort order alone? I sort by capture date. I didn’t have time to research this, but the issue appears to be with NGG 2.0.66.x not always removing deleted images, which causes issues with republishing. This could be a permission releated issue. According to my research, this bug/behavior was introduced by Photocrati either in 2.0.66.17 or in 2.0.66.27. With 2.0.66 original files are being removed on republishing, as expected. I have opened ticket with Photocrati regarding the issue. Hi Vlad – I love your plugin, and never would have started using NextGen Gallery without it. However, I just checked my first attempt at using a Smart Gallery, and can’t seem to find a way to make it “update” itself — how can I get newly imported files to be added to it? I don’t mind not happening automatically, but I can’t figure out a manual way to refresh, either. Is there something I’m missing? Photos in smart collections appear automatically once Lightroom finds more photos that satisfy the collection’s criteria, however you still need to publish updates by hand. Simply select your smart collection – you would see if there are new/updated photos in it, then click Publish. Thanks, Vlad! I missed the “Flagged” condition on my Smart Gallery — once I flagged one of the new pictures, it appeared as expected. Thank you again! I need to show the file/image name for every image i upload to nextgen gallery, but i can not find the setting for that. Is it possible to do it? I upload my works to my site so my customer can select the images they want to buy, but without the filename the image have no ID. It can be used as an export post action to generate a list of file names (and other attributes as needed) of exported photos. It tells me I may be getting blacklisted but when i reduce the size of the image it works. It takes 900 longest side but not 1500. HTTP Error codes may be sometimes confusing. Submit your debug log – this is the best way to tell what’s really happening. Also, check out the FAQ page, see the article about memory and post size settings. After using NextGen Gallery V2.2.10 for ages, its started giving me error 403 on every photo. What should I do? 403 errors are usually a sign of misbehaving security measures. Start by turning off mod_security, see if that solves the issue. If it does then review and revise its rules. Next suspect is a rate-limit imposed by your hosting provider (read about related issues on this page).